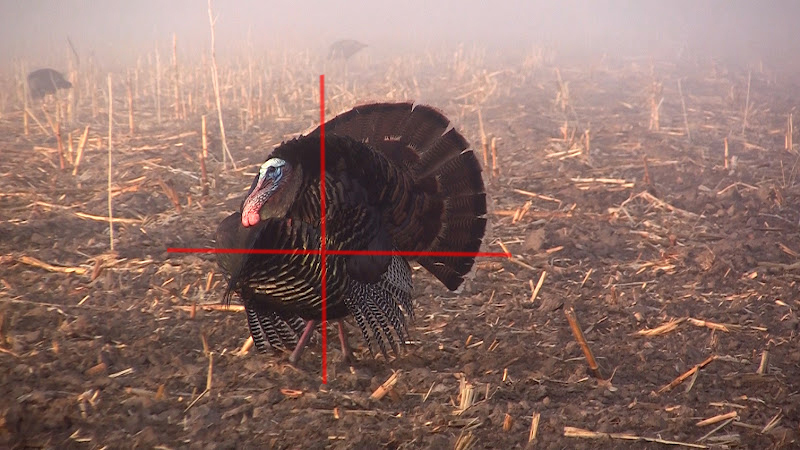 Well I finally got the turkey videos from opening weekend up on YouTube. Lets take a look at these shots, and I will offer my comments on the shot placement and the effects of each shot. 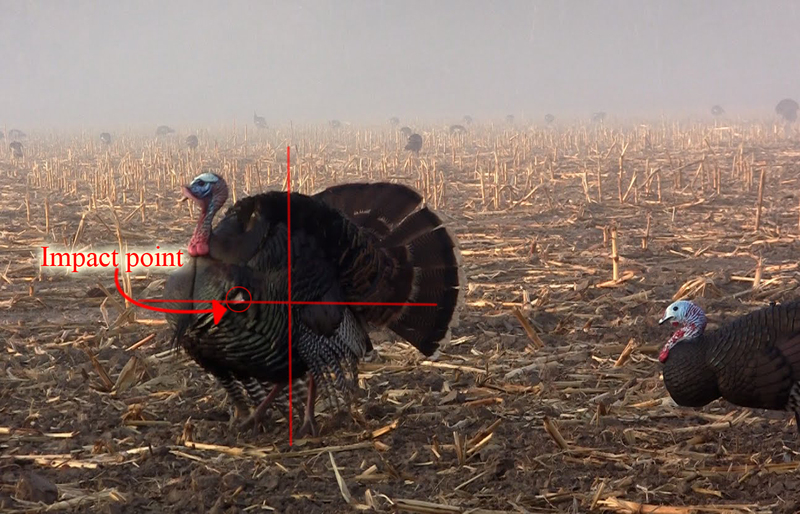 Let me start by saying that it is extremely difficult to guarantee shot placement on an animal this small, and one that moves around as much as turkeys do. For this reason I shoot the largest broadhead that I can get to fly well. Because the chances are high that an arrow will go through non-vital portions of the turkey, I want to cause as much damage as possible to create as quick of a death as possible. 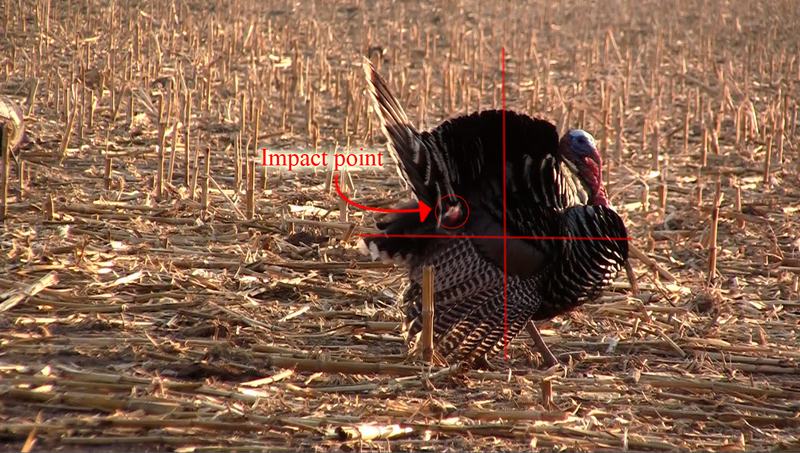 It's not like turkeys are large birds, so a large broadhead does a lot of damage. But at the same time they can be incredibly difficult to kill. 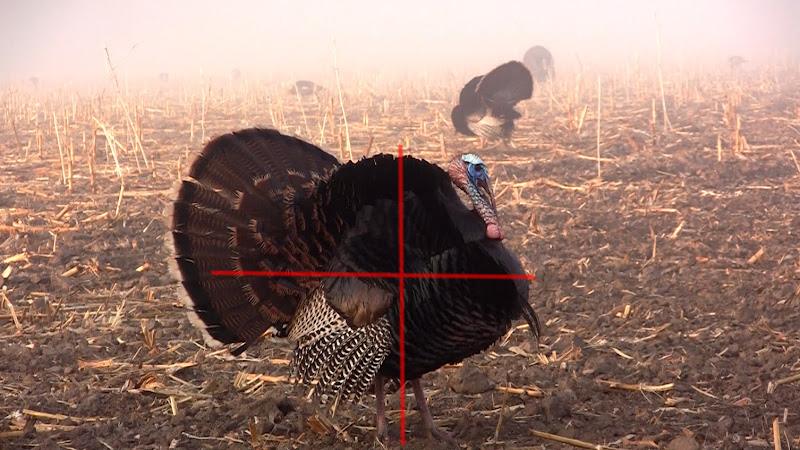 My experience has led me to become a firm, firm believer in LARGE broadheads for turkeys. We'll start with the turkey that I killed on opening morning. Watch the video first and then we'll discuss the outcome. The turkey died at the spot last seen in the video. You can see that I missed by shooting higher and to the left of where I would ideally like to shoot. Having seen several turkeys shot in this exact same place I knew that this turkey would not go too far. You can see the damage done to the turkeys leg by the way he was walking. It would have been difficult or impossible for him to fly away. I was shooting an extremely wide four bladed broadhead. The bloodtrail from the spot of the shot to where the turkey died would make any deer hunter happy. You can even see the blood pumping out of him in the video. So, while I don't recommend this spot to shoot a turkey in, I have seen it be quite lethal, several different times. Next lets take a look at the turkey my Dad shot. This turkey required a follow up arrow a short time after the initial shot. This was a breast shot and did not pass through any vitals. The shot should have been further back, towards the intersection drawn. We knew right away that it would require some time to recover this turkey. Lucky for us he stayed within our sight for the entire time. The turkey laid down on a hill, so Dad came up the back side of the hill, while I walked straight towards the turkey. He ran up the hill and Dad met him on the other side. The turkey was too weak to fly and had a hard time running. I truly believe that if we had pursued this turkey right away we would have never gotten him. He would have had the strength to run or fly well out of our sight. Also, I think it helped that we were able to watch him for a long time and see where he laid down. Had he wanted to I am sure he could have covered quite a bit of ground before laying down. All in all, I hate this spot to shoot a turkey, it usually leads to very difficult recoveries, and almost always requires a follow up shot. But sometimes you get lucky! Now lets take a look at the turkey that Ashley shot. As you can see Ashley made a great shot (third time's a charm!) and the turkey died on the spot. She completely took out the far leg and it was barely salvageable to eat. I would also like to share my thoughts on shot placement, and my reasons why. I have been a part of around 50 turkeys shot with traditional archery gear and my opinions are based off of my observations from those experiences, as well as research I have done on my own. I shoot at turkeys from any angle the shot presents itself, and I aim at the intersection of an imaginary line drawn straight up from the legs, and horizontal from just above the beard. Essentially this is the top of the hips for a broadside shot. I shoot here for two main reasons. One: I have a hard time picking a spot on a turkey, especially a tom in full strut. So looking straight up from the legs gives me a good reference to where his body actually is, and helps me zone in on a small aiming point. And Two: I have found that from any angle the turkey is standing, this intersection is very lethal, and kills the turkeys quite quickly. If I miss my aiming spot low or high I have a good chance of taking out the turkeys hips, and a turkey that cannot run very well cannot fly, so recovery is easier. A shot that is a little too far forward is still within the body of the bird, and a shot that is a little too far back will shoot through the guts of the bird and allow for an easy recovery. In two of the videos below you'll see shots that were both too far forward and too far back. Both turkeys were recovered without problem, one dying in sight, and one requiring a follow up shot (but the bird was too weak to fly). I have lost too many turkeys over the years. However, since aiming for the birds hips, my success rate in killing turkeys has been 100% for the last few years. Losing a wounded bird can, unfortunately, be easy. A turkey that flies away is very hard to find, and they can hide as good as a pheasant. By taking out their hips I have seen a dramatic increase in the ease of recovering my own turkeys. Hopefully I'll have some more videos later on this season! Check back in the next few weeks!